I live near Belmont and Ashland. Does Anyone know where I can pick up some Ramps. It's not quite ramps season, yet, is it? Soon, though. You'll be able to find them at your neighbor's place - Whole Foods. They had them a lot last spring. Christopher Gordon wrote: It's not quite ramps season, yet, is it? Soon, though. I hope it is. Rampfest is this weekend. Morels are always hot on the heels of ramps and they's a good two weeks(at least) off. Depending on weather conditions who's to quibble? Good hunting and gathering! I remember seeing ramps at WF in the past, as well. It's so much more fun gathering your own ramps, I expect. I can't wait to go morel hunting this year. Last edited by Christopher Gordon on March 27th, 2008, 8:56 pm, edited 1 time in total. Yinz (as we say in Pgh) make me sick. I still got over a meter o' neige in my front yard, underbeneath which is my chives. Ramps, hah! Morels, hah, hah. BTW, I just noticed that, with this post, I hit the thousand mark. I am not too optimistic people will be finding ramps soon. The snow we are having in Chicago this evening is as far south as Springfield. I just got off the phone with a friend who just came up 57. Morels will not likely be in our region until late April or early May. While Christopher Gordon now residing in Indianapolis is far enough south to be a few weeks ahead of us. I know I sound like a broken record. The collecting of ramps is usually lifting the plant. This drives forest managers crazy because the plant is getting destroyed. It is not in the same catagory as fruiting bodies like mushrooms, nuts and berries. If you are collecting these from public lands, then you run the risk of a fine. 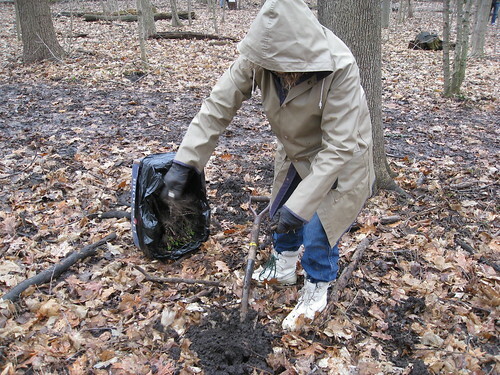 BTW - Mushroom hunting is not welcome in all jurisdictions, either. I've only had ramps twice: some I bought at the Madison farmer's market and the other was a gift from a friend who collected them on private land. Cathy2 wrote: I know I sound like a broken record. 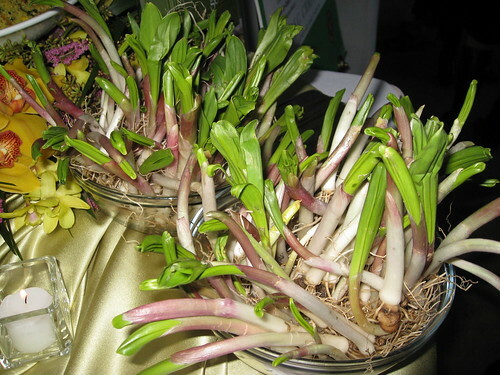 The collecting of ramps is usually lifting the plant. This drives forest managers crazy because the plant is getting destroyed. I would never harvest public lands, of course, and it's my understanding that places like Spence Farms make a point of leaving some ramps in the ground to reseed for the next year. I am intrigued by the possibility of getting some ramp seeds (which, apparently, are available) and planting some in my yard. Incidentally, I am going to the RampFest dinner tomorrow, and the idea is that they're using ramps that have been harvested locally. Will report. I have never met anyone from LTH Forum so I hope to see you there. I went hunting, overly optimistically, Wednesday. Not yet! I did see my first butterfly of the season though! Went to Rampfest, the most excellent Land Connections benefit last night. I don’t believe I’ve eaten ramps before, and I must say, these roots delivers some serious flavor, a cross between onion and garlic, and they taste much better than they smell. A challenge with cooking them seems to be to balance the flavor of the ramp with the other ingredients, which ain’t easy. David Hammond wrote: Went to Rampfest, the most excellent Land Connections benefit last night. Man! Those look tasty. I obviously have no clue when it comes to ramp weather. The Wife ripping out ramps by the boxload. They were not big and they did not put up much of a struggle. Very informative and interesting report. Whole Foods on Halsted has them. $16.99/lb! They've only had them for about a week, don't have a big supply and he said that the price should come down as they are able to get a bigger supply. Am going to go with some asparagus, marinated for a short time in olive oil, salt and lime juice. Should go well on the grill with some tri-tips from Costco, homemade chimichurri sauce and some potatoes. Haven't decided how I want to cook those up. Whole Foods Evanston has ramps for $2.99 a bunch of 10-12. Very small compared to those pictured above. Last night sauteed them with fresh peas and ready for more. A small bundle of ramps was included in my Fresh Picks box on Friday. I'd never prepared ramps before. Determined to use them in some way for dinner tonight, I did a quick Google search and decided on this Splendid Table recipe for pasta with ramps. I used 1/2 oil, 1/2 butter, spaghetti and no pancetta. It turned out beautifully. It's a very simple dish, but the flavor of the bulbs and the greens really sang. I highly recommend this recipe as an introduction to the marvel of ramps. Anyone have a pickled ramp recipe? You might try to treat them as pa kimchi--kimchi'd spring onions. I've had it and it's really delicious. I suspect that this would be a natural application for ramps. 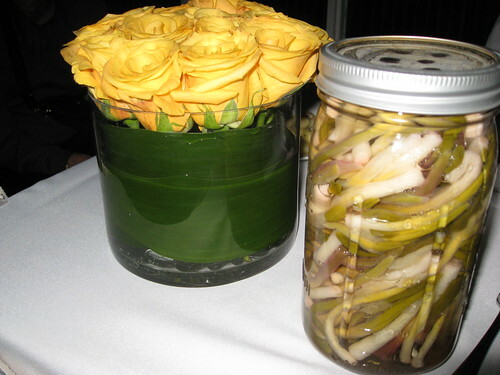 Vital Information wrote: Anyone have a pickled ramp recipe? Use equal parts water and white wine vinegar. Use sugar equalling half the amount of the water. Bring liquid to a boil and then add plenty of black pepper seeds and mustard seeds in equal parts. Cool. Pickling recipes usually call for additional spices like coriander and fennel, but I like my pickled ramps to taste more like ramps and less like pickles. Blanch the ramps (30 secs max) after thoroughly washing and cool in ice bath to stop the cooking. Use salted water for the blanching, not your brine. Put ramps in a jar and pour brine over. Let sit for 2-3 days if you plan to use them within a couple of weeks. If the plan is to store longer term, brine for 5 days and then vacuum seal. Note: I do not think ramp tops take well to pickling. I just use the bottoms. Great idea! I bet that would taste great! 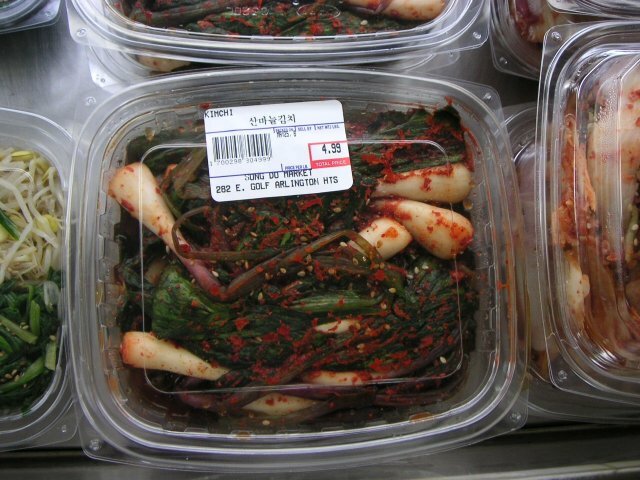 Also, staying in the Korean vein...you could chop up the ramps for an excellent version of pajun, I imagine. Saw these at Song Do Market yesterday. Man, those look good--did you get some?? Anyone seen ramps at the grocery this season? Not locally, but the first 2016 outdoor Dane County Farmers Market in Madison is Saturday, and they will have ramps. You should go. it's such a trip, even this early in the year.